This impressive painting by Edward Moran does justice to the epic America's Cup Challenge of 1885. Moran's point of view captures the day's enormity to the world's yacht racers and designers. This account portrays PURITAN's second and decisive victory of the match on the 40-mile course, 20 miles leeward from the Sandy Hook Lightship and back. PURITAN reached the line a scant 1 minute 38 seconds in front, the closest margin of victory to date. Well publicized and awaited on both sides of the Atlantic, the race held the public's interest while knowledgeable yachtsmen waited to see if Boston's Edward Burgess had innovated the centerboard sloop design to a degree capable of holding off the challenge of a true English cutter. GENESTA was designed by John Beavor- Webb, for her owner, Sir Richard Sutton. 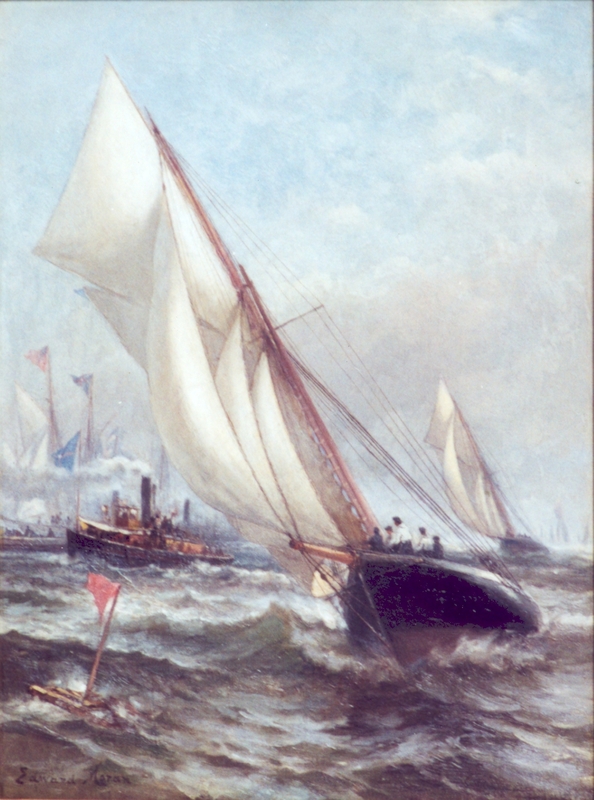 Strong in composition and detail, Moran also features the spectator fleet waiting at the Sandy Hook finish line, many bearing the bright blue & red burgee of the N.Y.Y.C. PURITAN's white bulwark led so many to emulate her that white coloration soon became the standard of almost all yachts to follow. Moran shares the building elation of her crew onboard, led by captain Aubrey Crocker, with PURITAN hard-charging the red-flagged finish line buoy on a challenging sea with GENESTA closely following. Puritan ne devrait pas avoir son fl�che �tabli.